The Inheritance is an exciting new play making its world premiere at the Young Vic, and we caught up with one its stars, John Benjamin Hickey. He has received an Emmy nomination for TV’s The Big C, on stage in Broadway’s The Normal Heart, for which he received a Tony Award, and on the silver screen in Pitch Perfect and Transformers: Revenge of the Fallen. Needless to say, it’s about time he made his West End debut! The Inheritance (which you can see with £15 Rush tickets!) is a story of generations of gay men in a post-AIDS New York city, and their lives and loves. We had a few questions for John about the play and what it means to him. 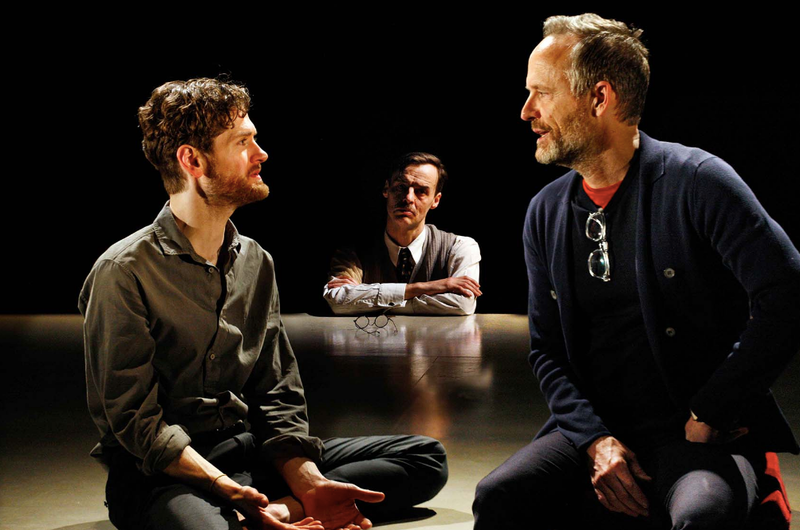 Photo Credit: (L-R) Kyle Soller, Paul Hilton and John Benjamin Hickey in The Inheritance, by Simon Annand. 1. What’s the thing you enjoy the most about working on the West End? I am so surprised and delighted at how many young people go to the theatre here at the Young Vic. I have nothing against older people going to the theatre, being one myself, but it’s very exciting to have such young, enthusiastic people in the audience, truly loving the play. 2. Of all of the mediums you’ve worked in, why theatre? What is it about theatre that you love? It’s because it’s happening then and there, that night (or that afternoon). It’s human-scaled. It’s a conspiracy between playwright, director and designers, actors, and audience. You are all in it together. 3. How would you describe your character in The Inheritance? Henry Wilcox, my character, is a man who suffers from a form of PTSD. His specific case comes from having survived the AIDS crisis. He finds himself surrounded by the younger generation, and is forced to make a choice: stay closed and protect himself, or open his heart again. That’s a very challenging and moving thing to play. Oh, and he is also a billionaire. I like playing rich people, as it’s different from my real life. 4. The story deals with a group of gay men living in New York – is there something in particular you’ve learned about that community from this experience? I have learned so much, which is ironic, because I AM a gay man who lives in New York. Sometimes distance gives you greater perspective. The themes of the play are completely universal. It could be set here in London, or anywhere. It’s about taking care of each other, and learning about who we are by looking at where we have been. 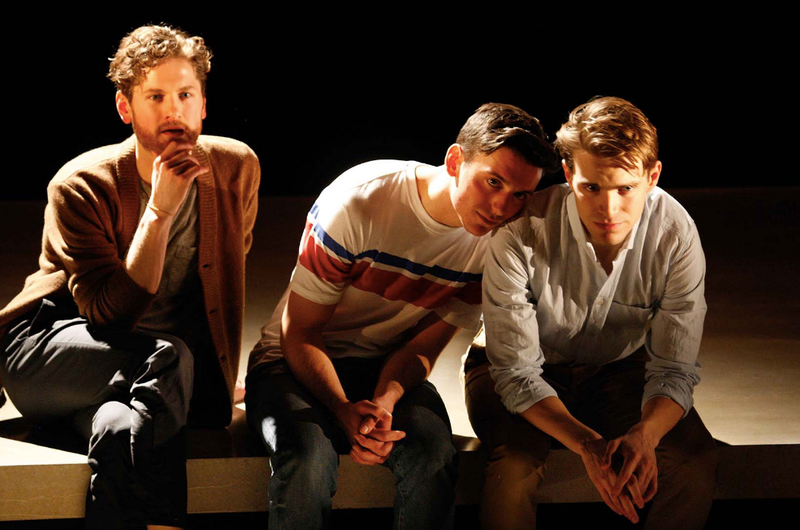 Photo Credit: (L-R) Kyle Soller, Samuel H. Levine and Andrew Burnap in The Inheritance, by Simon Annand. 5. What has your experience been like working with Stephen Daldry? 6. How does it feel to be part of an original cast, opening a show for its world premiere? Terrifying and thrilling, in about equal measure. 7. What’s the thing you think London audiences will take away from the show? It sounds corny, but because of the length and breadth of the play, not to mention the overwhelming emotional journey it takes you on, I think audiences leave with a feeling of being very, very enriched. Also hungry and thirsty, but that’s why there is a bar attached to the theatre. See The Inheritance at the Young Vic from £15 with exclusive Rush tickets! Related blogs: The Inheritance Show Breakdown.